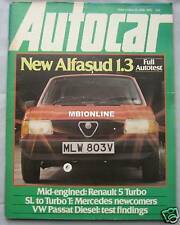 This auction is for an original edition of Autocar & Motor magazine from 6 September 1989. Also included is an 82 page ‘Pictorial history of motoring’ supplement, full of archive photos from Autocar & Motor magazine history. The ‘Pictorial history of motoring’ supplement has photos dating back as far as 1895 showing how cars have developed over time. 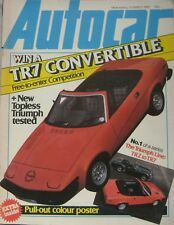 The main magazine has many interesting period articles and adverts including a look at new cars for 1990. Both parts are in very good condition with only minor wear. AutoCar Magazine. 9 July 1983, 68 pages and in very good condition. I can send a larger and clearer picture if requested. AutoCar Magazine. 15 May 1985, 90 pages and in good condition. I can send a larger and clearer picture if requested. AutoCar Magazine. 28 June 1980, 98 pages and in good condition. I can send a larger and clearer picture if requested. AutoCar Magazine. 15 March 1980, 88 pages and in good condition. I can send a larger and clearer picture if requested. AutoCar Magazine. I can send a larger and clearer picture if requested. AutoCar Magazine. 28 May 1983, 64 pages and in good condition. I can send a larger and clearer picture if requested. AutoCar Magazine. 2 February 1980, 84 pages and in very good condition. I can send a larger and clearer picture if requested. AutoCar Magazine. 21 August 1982, 60 pages and in good condition. I can send a larger and clearer picture if requested. AutoCar Magazine. 15 November 1980, 94 pages and in good condition. I can send a larger and clearer picture if requested. AutoCar Magazine. 12 July 1980, 108 pages and in good condition. I can send a larger and clearer picture if requested. THE MAIN FEATURE IS ABOUT THE DISCOVERY OF THE NEW ASTON MARTIN V8, THAT WE ALL KNOW NOW AS THE VIRAGE. 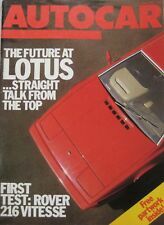 This is a classic British car magazine. AutoCar Magazine. 15 July 1987, 122 pages and in very good condition. I can send a larger and clearer picture if requested. AutoCar Magazine. 30 July 1983, 60 pages and in good condition. I can send a larger and clearer picture if requested. AutoCar Magazine. 31 August 1988, 138 pages and in good condition. AutoCar Magazine. 11 October 1980, 100 pages and in good condition. I can send a larger and clearer picture if requested. AutoCar Magazine. 29 October 1983, 80 pages and in good condition. I can send a larger and clearer picture if requested. AUTOCAR MAGAZINE 10TH OCTOBER 1984. TOYOTA CAMRY 2.0 GLi. PARIS SHOW TESTAROSSA. AutoCar Magazine. 7 August 1983, 72 pages and in good condition. I can send a larger and clearer picture if requested. AUTOCAR MAGAZINE 6 AUGUST 1986. BMW 7 SERIES. ALFA ROMEO 75 1.8. VW CARAVELLE. 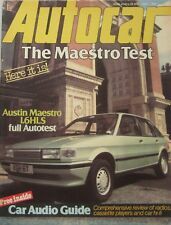 A Good condition Autocar magazine from 6th August 1986. AutoCar Magazine. 15 April 1987, 114 pages and in good condition. I can send a larger and clearer picture if requested. AutoCar Magazine. 26 May 1984, 72 pages and in good condition. I can send a larger and clearer picture if requested. AutoCar Magazine. 27 February 1985, 82 pages and in very good condition. I can send a larger and clearer picture if requested. AutoCar Magazine. 29 April 1987, 114 pages and in good condition. I can send a larger and clearer picture if requested. AutoCar Magazine. 5 March 1983, 84 pages and in good condition. I can send a larger and clearer picture if requested. AutoCar Magazine. 21 May 1983, 72 pages and in good condition. I can send a larger and clearer picture if requested. MONTH -----AUGUST. DATED FROM YEAR ----- 1980. AN ORIGINAL ISSUE OF THE MAGAZINE. NOT IN THE U.K ?. we are always available. over the phone. AND NO UNEXPECTED FEE'S UPON ARRIVAL. SO THERE WILL BE NO LONG WAIT TO RECIEVE YOUR ITEM. I can send a larger and clearer picture if requested. AutoCar Magazine. 11 December 1985, 106 pages and in good condition. I can send a larger and clearer picture if requested. Publication AUTOCAR. Features Lancia Delta 1.5 automatic. Cover Story Triumph over tradition?. Triumph Acclaim 1.3 HL. Date 10 July 1982. BUYING SECONDHAND FRONT-DRIVE FORD ESCORTS. 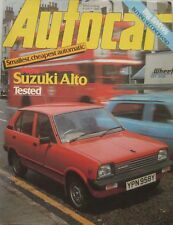 AUTOCAR MAGAZINE 28TH JANUARY 1984. STRATOS LANCIA'S PLEASURE MACHINE. SMOOTH COUPE MAZDA 626 2000 TESTED. AutoCar Magazine. 31 October 1984, 74 pages and in good condition. I can send a larger and clearer picture if requested. AutoCar Magazine. 8 January 1986, 74 pages and in good condition. I can send a larger and clearer picture if requested. AutoCar & Motor Magazine. 19 April 1989, 154 pages and in good condition. This may result in your suspension and I will have no option but to re-list the item. 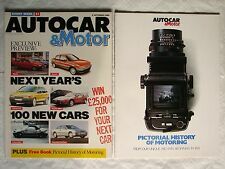 AutoCar & Motor Magazine. 21 September 1988, 194 pages and in good condition. I can send a larger and clearer picture if requested. New Cars Ford Orion 1600E. Publication AUTOCAR. Nissan Prairie SLX vs Renault Espace 2000 TXE. Features Alfa 164 V6 Automatic. Date 21 June 1989. Slight wear to magazine spine. 1-page report/pictures from the Rally of 1000 Lakes. Auto Test - Rolls-Royce Silver Spirit. 1-page - testing the Fuel Saver automatic engine idle stop-start device on an Opel Monza. AUTOCAR MAGAZINE 20TH OCTOBER 1984. BENTLEY EIGHT DRIVING CREWE'S PRICEFIGHTER. MOTOR SHOW 1984. Publication AUTOCAR. Citroen AX 14 DTR vs Daihatsu Charade Diesel Turbo. Features Renault 19 TSE. Cover Story Renault 19. Porsche 911 Turbo 5-speed. Date 15 March 1989. AutoCar Magazine. 28 April 1984, 80 pages and in good condition. I can send a larger and clearer picture if requested. AUTOCAR MAGAZINE. DATING MAY 4th, 1988. HERE WE HAVE A USED MAGAZINE. USED ITEM. WORN OUTER COVER. 10 pages and in very good condition. I can send a larger and clearer picture if requested.